Zaid Jilani is Commuications and Outreach Coordinator for United Republic. He is the former Senior Reporter-Blogger for ThinkProgress. His work has also appeared in outlets including Salon and the Atlanta Journal-Constitution. 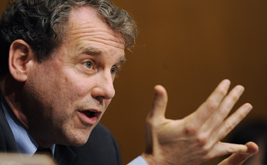 Senator Sherrod Brown has been a leader in taking on the big banks, and now the Chamber of Commerce is retaliating. Legislators who are leaving the corporate front group ALEC deserve applause. "I dream of the day that our children will turn the pages of history books and look to my generation, who said no to the horrors of war and chose nonviolence over nonexistence."